Among the last of Nokia's feature phones, the C3 is available in two variants: one has a QWERTY bar design while the other one has a candy bar touch and type design. Both devices run on the Nokia Series 40 operating system. The handsets under the Nokia C3 series have been well received by the local market and even considered very dependable feature phones. Although, they are not as popular as the other smartphones, they are still preferred by those who are still not comfortable with smartphones. The Nokia C3-00 features a 2.4 inch LCD transmissive screen display with a 320X240 pixel resolution. It sported a classic QWERTY phone design with dedicated hardware keys that include a Messaging Key, 5-Way Scrolling, Contacts Key and 3 Labelled Soft Keys. The C3 runs on Series 40 operating system and has a 64MB RAM as well as 55MB internal memory which can be expanded up to 8GB via the micro SD card slot. The device connects to 2G and 3G networks and comes with WiFi and Bluetooth connectivity. It is supplied with a 1050mAh battery with a maximum talk time of 5.6 hours, GSM standby time of 405 hours and maximum standby time of 801 hours. In terms of productivity features, the handset comes with many personal information management applications including Digital Clock, Recorder, Calculator, Calendar, Notes, Converter, Analogue Clock and a To-do List. Synchronization of data is via the Remote SyncML. Email solutions include Nokia Messaging, Nokia Mail and Oz Email. On the other hand, you can send messages as SMS, MMS + SMIL, AMS and IM via Nokia Chat, Windows Live Messenger, Hangouts and Yahoo Messenger. For browsing the internet, you can use the Nokia Browser or the Opera Mini. The Nokia C3-00 comes with a primary 2MP camera with 1601X1201 pixel resolution. Other camera features include 4x digital zoom, sequence mode, full screen viewfinder, self-timer and full focus. You can choose from the many image capturing modes based on colour tome, white balance and scene. Photos can be viewed by Slide Show, Album and Timeline. As for taking video, the handset is capable of capturing videos at 176x144 pixel resolution. It supports several video playback codecs and file formats and feature video recorder, video streaming and video player. Meanwhile, audio features include Playlists in Music Player, Audio Streaming, Album graphics display, audio streaming, handsfree speaker, Bluetooth stereo, MP3 ringtones, FM radio and audio recorder. It also supports many music codes and formats. Other applications include Java games, Flight Mode, Nokia contacts and Nokia Store. The device is available in White, Gray and Pink and sold at around Php 3601. 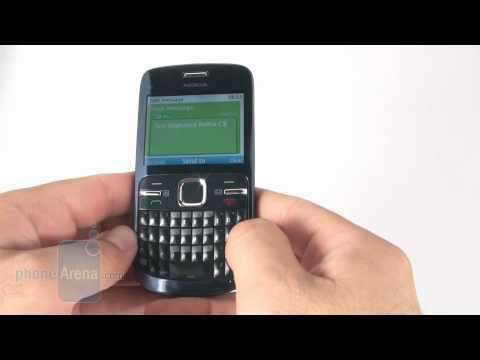 The Nokia C3-00 boasts of a super mini QWERTY keyboard which is surprisingly easy to use. It also has good Twitter and Facebook integration and WiFi connectivity. The device is not 3G capable and offers poor web browsing experience. The average camera quality is also a disappointment. I just want to ask if this mobile is still available? how to activate wifi in nokia c3-00? The problem when the LCD seperated to the Cellphone itself. It occured to me when the phone's case was a bit weak and then i drop it. I was shock when the LCD was removed and the Bronze colored thingy that connects them was separated from each other. Any advice on how to personally fix it? Thanks.